The video is graphic. Too graphic. 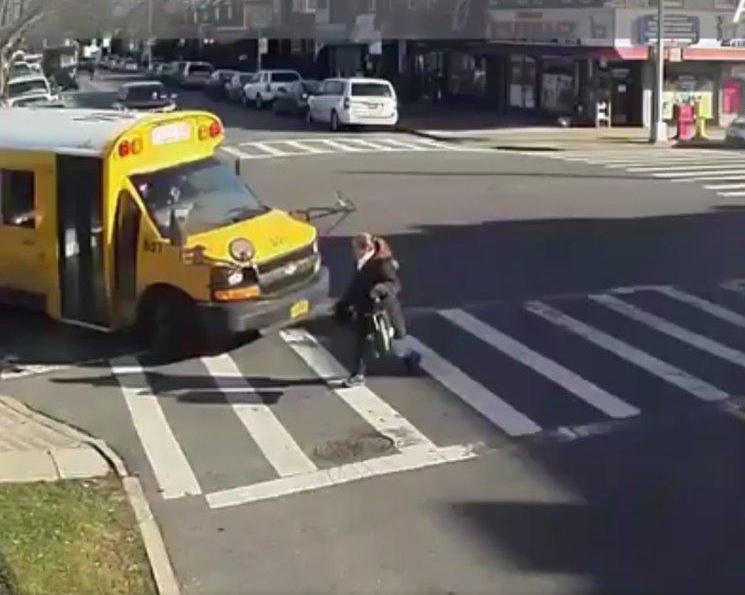 A woman clearly in the cross walk gets hit by a mini school bus. The story from this Brooklyn accident at Nostrand Ave. and Ave. M, comes courtesy of the Daily News. Why write about it? Two reasons. The initial police report said the victim was “not in an intersection” but the video shows her clearly walking in the crosswalk. Police could not immediately account for the discrepancy. How and why could that “error” happen? The victim, Ayse Ayaz, suffered four broken ribs, a broken collarbone, a broken leg, and a swollen bloody eye. Ayaz woke up in the emergency room. The information about being out of the cross walk, in other words, was unlikely to come from her. Rather, the false information most likely came from the driver of the bus. The video was found later by a local business. The questions for this bus collision would follow the same path: Who was the first person the driver called? Was it 911 or some dispatcher? If 911, was the story told at first different from the one told to the police later? If it was to the dispatcher first, why? This is the nature of litigation. People will lie to protect themselves, which appears to be what happened here. Except now there is something very rare — hard proof of what actually happened. Over the years readers have seen me approach many litigation issues here with a cynical eye, not quite trusting the statements that may be made in support of what position or another. There’s a reason. It’s not in the least bit uncommon for a driver to tell a wholly different story than the victim, or the eyewitness standing on the corner, if that person actually sticks around and the police actually write that person’s name down in a report. I know, you think the cops always write down the names of witnesses. It ain’t so. And the failure to take a couple of minutes to do so can cause years of litigation. In fact, this same scenario happened to me, when I witnessed a pedestrian hit by a car. I gave my name to both the driver and to the cops. And you know what? I was told by one of the attorneys at my deposition that the cops never wrote my name/number down in the report. If the driver didn’t have my name and number also, this piece of evidence (my eyewitness account) would have been lost to the actual participants. If not for this video in this bus-pedestrian collision, the bus driver would no doubt have an insurance company attorney accusing the pedestrian of being a liar when she claimed she was in the cross walk. She would, in effect, have been victimized twice. I said there were two reasons to write, and now comes the second: This is all something to think about when you hear people talk about a “litigation explosion” and tort “reform,” as if problems were caused by the victims themselves. It’s worth nothing that if the injuries of the victim are bad, it wouldn’t be a private insurance company paying for the losses. Not only could the victim be deprived of full compensation, but also, some of those costs of caring for the injured could be shifted to you and I, the taxpayers. And so it is that I started this piece with a bus-pedestrian collision. But end it at a public policy discussion, which is important due to the shift in the political winds. I am not a lawyer, but, given the technology which exists today to spoof/edit/alter/fake any form of digital imagery, were I defending for the insurer (forgive me, God), I would throw up a whole bunch of chicken scratchings about such technology to claim that the video cannot be believed. Our very own PRESODENT disputes clear photographic unfavorable evidence as being faked. It would be my tech expert against the plaintiff’s in the mind of the jury. May the best obfuscater win! given the technology which exists today to spoof/edit/alter/fake any form of digital imagery, were I defending for the insurer (forgive me, God), I would throw up a whole bunch of chicken scratchings about such technology to claim that the video cannot be believed. Which is why a video (or photo) must be authenticated to go into evidence. We can’t just put it into evidence ourselves. In this case, a lawyer would find the person that runs the security camera and put that person on the witness stand to testify that this is unedited video.